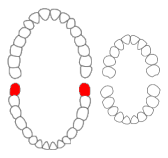 Schematic of mandibular third molars in the human mouth for permanent teeth. There are no third molars in primary teeth. Uploaded by Dozenist, with special thanks to Renee1137 for first creating the picture.